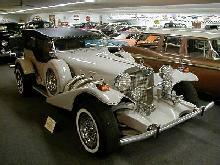 Excalibur is probably the longest running of the makers of neo-classic cars. The marque was founded by the renowned designer Brooks Stevens who was responsible for designing the Jeep Station Car in 1948 among other projects. In 1964, with his two sons, he built a car that closely resembled the Mercedes SSK of the 1920s.